Federal officials on Tuesday announced that because of an effort by dozens of partners across 11 Western states, the greater sage-grouse does not require protection under the Endangered Species Act. DENVER – The greater sage-grouse will not be listed as endangered thanks to state and private efforts to protect the flamboyant Western bird, federal officials announced Tuesday morning in Colorado. “What we are witnessing is a glimpse into the future of the West,” said Interior Secretary Sally Jewell, surrounded by four Western governors, other federal officials and dozens in attendance for the nearly hour-and-a-half news conference at Rocky Mountain Arsenal National Wildlife Refuge in Commerce City. While the announcement was filled with pomp and circumstance, some quickly questioned the longevity and security of the conservation effort. It features new land-use plans that focus on habitat conservation. Fears have been expressed that sweeping land-use plans would undermine state conservation efforts and burden ranchers and energy companies. “While the ‘not warranted’ decision is welcome, the implementation of equally oppressive land-use plans, which do nothing to improve on the work already being done locally to preserve the grouse, still leaves Colorado and other Western communities in a worrisome situation,” said U.S. Rep. Scott Tipton, R-Cortez. Federal officials with the Bureau of Land Management and Forest Service have finalized 98 land-use plans across the West. The plans were developed in collaboration with federal, state and local partners. Jewell was careful to point out that her department could revisit an endangered listing at any time in the future. “If we back away from these plans, if we’re not funded adequately to do this work, if we’re unable to implement our rangeland fire strategy, then it might cause the Fish and Wildlife Service some years from now to say, ‘well, what you said you’d do isn’t being done,’” Jewell said. Others worry that the plan doesn’t go far enough. “This is a species that already is on the brink of extinction across much of its range, and the kinds of human impacts ... that put the sage-grouse on the brink of extinction in these parts of its range are going to continue,” said Erik Molvar with environmental group WildEarth Guardians. Conservation discussions began after concerns were raised that the chicken-sized bird was going extinct. 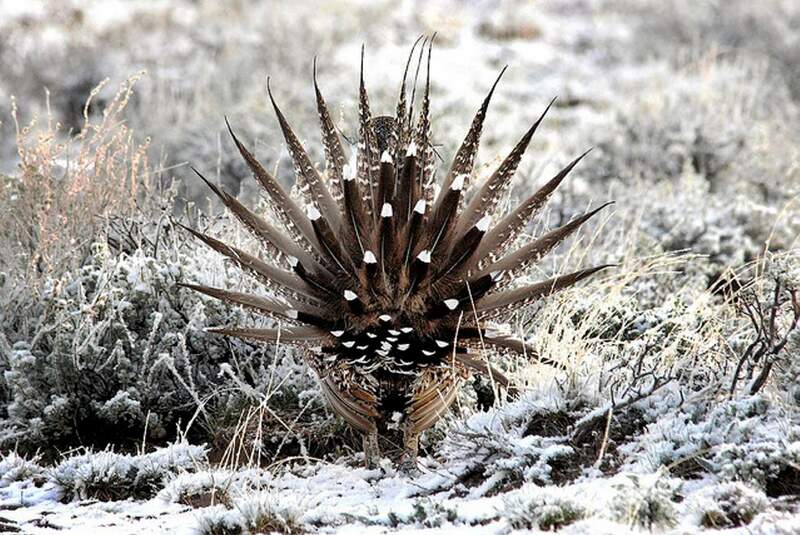 Greater sage-grouse once occupied more than 290 million acres of sagebrush in the West. Early settlers reported seeing millions, but the population has dwindled to a half-million or fewer. At least half of the bird’s territory is on federal land. Advocates of protecting the bird pointed to development on grouse habitat, including exploration for gas and oil, which has limited the bird’s territory, making it difficult for them to mate and nest. But state and private efforts across the species’ 173-million-acre range have reduced threats to 90 percent of the grouse’s breeding habitat. Sage-grouse remain relatively abundant and well-distributed, officials said. “It’s a very popular thing right now to take punches at our federal government, especially in the West, but when we have an opportunity where they have helped bring everyone together and create something that really is meaningful, then we should celebrate what good partners they can be, and hopefully inspire them to continue to be great partners,” said Colorado Gov. John Hickenlooper, a Democrat, who attended the news conference. Colorado last Thursday requested recognition by federal agencies to establish the Colorado Habitat Exchange. Under the plan, ranchers are encouraged to participate in voluntary conservation efforts. The program would offer financial incentives to create, maintain and improve habitat. Landowners would earn conservation credits, which could be sold to industry stakeholders to compensate for development.